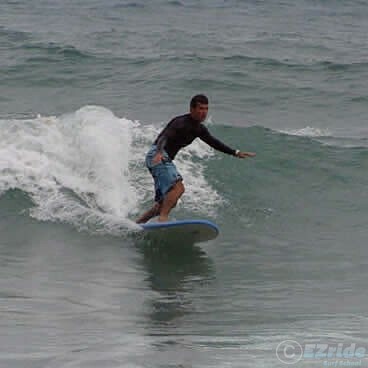 Surf Lessons in Florida with EZride Surf School Florida. Learn to Surf! Learn to surf from a real surfing pro. 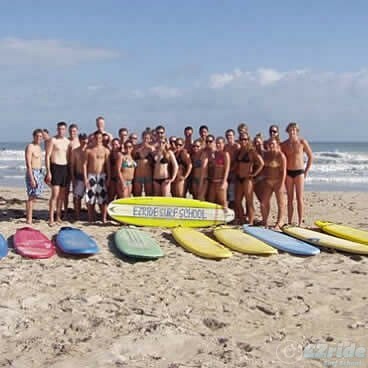 WELCOME TO EZRIDE SURF SCHOOL FLORIDA! We provide professional surf lessons for Florida residents and vacationers from all over the world. 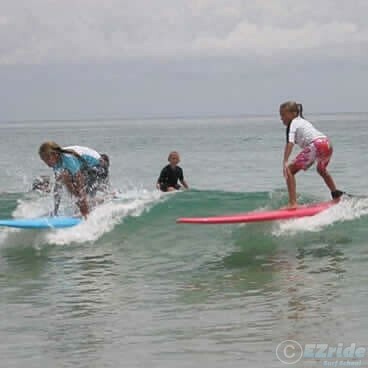 Our surf lessons are oﬀered in many beach areas of South Florida and Central Florida. We are currently oﬀering surf lessons in Florida 7 days a week, for all ages and skill levels. We are happy to help you with any surf information, and work with you to improve any surf technique. Cut backs, aerials, or simply ﬂowing and having fun on the waves, are some of the surf moves you can learn with EZride Surf School. You will receive valuable surf training and ocean education to start your surf journey, or to turn your vacation into an exciting surf experience. Please read all the following information and contact the school to ask any questions or schedule your surf lesson. Come and learn to surf with us! To read more about EZride Surf School, and why our quality of service is out standing, visit our surf philosophy page. Beginners safe equipment necessary or advanced equipment for experienced riders. ALL SURF INFORMATION INCLUDED: Surf equipment, water safety, oceanography, surf forecast, selecting proper surf equipment. Surf lessons for beginners, intermediate, and advanced levels. SURF LESSONS FOR – singles, couples, small and large groups, surf camps, and families. Children, starting at age 5, and all ages of adults are welcome. SURF LESSONS FOR SPECIAL EVENTS: Birthday parties, corporate team building, bachelorette and bachelor parties, bar mitzvah and weddings. After you reserve your lesson, you just have to think about surf and the good time you will have. We provide all the equipment necessary, monitor the wave conditions, and give you all the surf information to prepare you for your surf lesson. Please, read our reviews, and visit the student’s surf pics. They will give you an idea of the high quality service you will receive, and will encourage you even more. For general information visit SURF CLASSES AND PACKAGES PAGE.